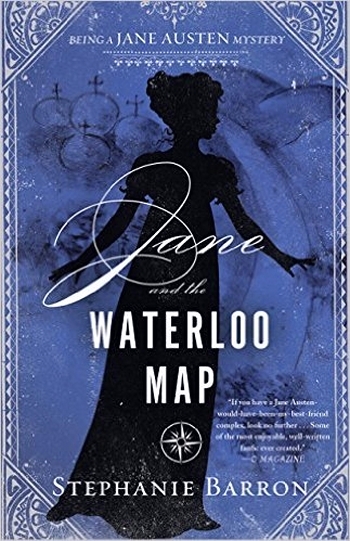 Stephanie Barron released a new book from the Jane Austen Mystery Series called Jane and the Waterloo Map. I was lucky enough to receive her at From Pemberley to Milton as part of the blog tour, and to place her a few questions. For me it was very interesting to hear what she had to say and I hope you also enjoy reading her answers. What captivates you about Jane Austen? I would have to say, first and foremost, her wit. 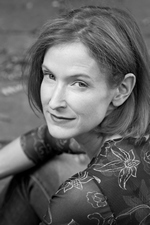 It is her clever appreciation of human foibles that is most apparent in her characterizations and the complex plots of misunderstanding and revelation that she constructs; and wit is the underpinning of both. As readers we experience it most forcibly in her dialogue—which is so rich that it operates on multiple and subtle levels. One of my favourite exchanges, for example, is in PRIDE AND PREJUDICE, during the scene where Eliza is playing the piano rather badly at Rosings. When she dares Darcy to criticize her, he simply says, “We neither of us perform to strangers.” It’s a brilliant line because of the multiple messages it conveys. He is saying, firstly, We are no longer strangers—we are intimate, and I understand you in a way I did not before. He is also saying: I want you to understand ME on an intimate level, too. And he is saying, finally, I am extending to you a privilege: because you are my intimate, I will perform for you as I never would for a stranger. And I want that privilege for myself, from you. When read this way, the single phrase, rather than a polite nothing, is immensely revealing. It makes a subsequent scene—in which Darcy proposes marriage—anything but a shock. When most people think about Jane Austen, they think about romance. What made you think about mystery? I am a lifelong reader of mysteries, particularly amateur-sleuth stories. It occurred to me that in a period in England when there was no organized police force, all criminal investigation was informal and amateur. In that circumstance, the chief skill a detective could claim would be an acute understanding of human motivation. Jane Austen’s novels are founded upon a keen perception of the human heart. I felt she could “penetrate”—a word she often used—the mind and motives of a murderer. She was the consummate observer who is rarely perceived as a threat because as a genteel spinster, she was part of her landscape. (Agatha Christie’s Miss Jane Marple comes to mind.) And she had access to the informal authority networks and systems of justice in her world, through her friends, relatives, and particularly her brothers who worked in every imaginable field, both in the country and London. What was it like writing JAFF 10 years ago? How was the reception to this genre? My first Jane Austen mystery, JANE AND THE UNPLEASANTNESS AT SCARGRAVE MANOR, was written 21 years ago, in fact. No one was writing what you term fan fiction then. The Colin Firth/Jennifer Ehle P&P came out around that time, as did the Amanda Root/Ciaran Hinds PERSUASION, and finally SENSE AND SENSIBILITY with Emma Thompson—all within months of each other. I hadn’t anticipated those productions when I wrote my first Jane novel. The timing of its publication looked suspiciously like an effort to capitalize on Austenmania. But as any writer knows, publication is just the end point of a two-year process and timing is always accidental. I considered the book an enormous risk, because I was trying to throw my voice as Jane Austen. Her voice is so distinctive that the possibility of failure was potentially great. Did you plan to write an entire series when you published Jane and the Unpleasantness at Scargrave Manor? Yes. At the time, series were valued in mystery publishing because readers liked to follow particular sleuths and their worlds over time. The fact that I was writing about Jane during a period in her life when she was an unpublished writer, and fairly itinerant—she did not settle in her final home at Chawton until the seventh book—meant that I could follow her around England during a scintillating period of political upheaval. There was a great deal of matter to use in successive stories. And her large cast of family characters made for a good series population. Do you spend much time doing research for the Jane Austen mystery series? I studied Napoleonic France and Regency England as a history major in college, but invariably I have to research specific topics within those periods for each book. Something as simple as the history of the Royal Academy of Art, for example, or the layout of Carlton House, or the details of the battle of Waterloo, or the properties of yew poisoning, come up in the course of writing a novel. But I regard the research as the fun part of any book. What gives you most pleasure during the writing process? Seriously, in writing the Jane books, I delight in her sense of humour. She could be viciously funny at other people’s expense—or her own—and when I speak for Jane I so enjoy being able to do the same. Like many of us who love her work, I believe she and I must be similar people. We would have enjoyed each other immensely. What can we expect from Jane and the Waterloo Map? I particularly like the fact that it charts an exciting moment in Jane’s personal life—her publication of EMMA with a bold new publisher, John Murray, and her visit to the Regent’s London home at Carlton house—with events that capture the imagination in the aftermath of the greatest battle in British history. There’s a treasure map. A picture vault. A lot of shopping expeditions in London. And a whiff of romance amid the bloodshed. Just my thanks for walking along with me on this journey through Jane’s life. At this point in the series—November, 1815—she has only 18 months to live. Having followed her footsteps from the time she was 26, I find this a bittersweet reality. I do not know how many adventures Jane and I have left. Hadn’t realized it was that long ago you began the series. So sad that the series seem to be coming to an end soon. I enjoyed what you said about all the layers of Jane Austen’s language. I love that! Huh, I didn’t realize the release of the first book hit right about the time as those movies. Then again, I spotted the series about the time book three came out. I enjoy the idea of Jane Austen as a detective and also that it was more about observation and analytical thinking than science back then. Ah, yes, it is bittersweet knowing this series is following her life and it is getting close to the end. But I do love the series and look forward to each new installment. The Body in the Library!!! Oh, I love Stephanie’s responses to your first question! That line is one of my favorites too. I’ve read so many different perspectives about what Darcy and Elizabeth are saying here … Thanks for adding new insights to this fabulous scene. Lovely interview. Wonderful series, I have loved from first book. Looking forward to reading this installment. This is my favorite mystery series. I have enjoyed reading each book and loved counting down the days whenever I found a new book in the series was on the horizon. I thought I would mention the two short stories that Stephanie has written that also feature Jane. 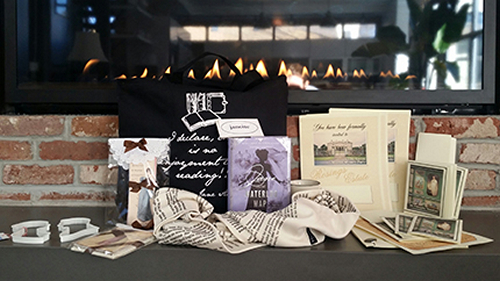 Jane and the Spoils of Stoneleigh published in Malice Domestic 7 edited by Sharyn McCrumb, and Jane and the Gentleman Rogue in Jane Austen Made Me Do It edited by Laurel Ann Nattress. Has anyone else had the chance to read these short stories? I have read Jane and the Gentleman Rogue. I hope there may be a series starring him in the future. 🙂 I don’t think I’ve read Jane and the Spoils of Stoneleigh. How could I have missed it! A wonderful interview, ladies! Are you working on the next one now, Stephanie, or one of your other mysteries? This book sounds so great. Thanks for the interview and the giveaway!! Wow, from history major to CIA analyst. Sounds like Ms. Barron’s had a fascinating life! Thank you for a wonderful interview. I will never read Darcy’s line from P&P the same again. It’s why these stories continue to capture our imagination 200 years later and why gifted contemporary authors can build on such strong foundations. Thank you for sharing this fun book and great giveaway. I have fun visiting your blog and reading the interview. I remember finding that first book, Jane and the Unpleasantness at Scargrave Manor in an airport bookshop. I was hooked. I loaned it to friend who actually thought it was true. I have to admit that sometimes in these stories I did forget that I was reading fiction. Thank you Ms. Barron for lots of years of entertainment. Love this series-can’t wait to read this one! Thanks for the chance to win! While getting my English degree I read Pride and Prejudice countless times – love the idea of reading this too! Insightful interview. I’m a huge fan of this series!